Comrades! I deeply regret that I must confine myself to self-defence. (Laughter.) I say deeply regret, because after acquainting myself with Comrade Terracini’s speech and the amendments introduced by three delegations, I should very much like to take the offensive, for, properly speaking, offensive operations are essential against the views defended by Terracini and these three delegations. If the Congress is not going to wage a vigorous offensive against such errors, against such “Leftist” stupidities, the whole movement is doomed. That is my deep conviction. But we are organised and disciplined Marxists. We cannot be satisfied with speeches against individual comrades. We Russians are already sick and tired of these Leftist phrases. We are men of organisation. In drawing up our plans, we must proceed in an organised way and try to find the correct line. It is, of course, no secret that our theses are a compromise. And why not? 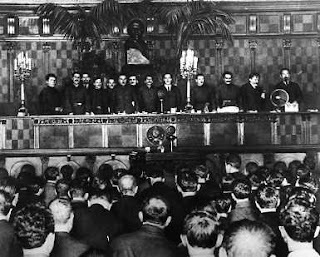 Among Communists, who have already convened their Third Congress and have worked out definite fundamental principles, compromises under certain conditions are necessary. Our theses, put forward by the Russian delegation, were studied and prepared in the most careful way and were the result of long arguments and meetings with various delegations. They aim at establishing the basic line of the Communist International and are especially necessary now after we have not only formally condemned the real Centrists but have expelled them from the Party. Such are the facts. I have to stand up for these theses. Now, when Terracini comes forward and says that we must continue the fight against the Centrists, and goes on to tell how it is intended to wage the fight, I say that if these amendments denote a definite trend, a relentless fight against this trend is essential, for otherwise there is no communism and no Communist International. I am surprised that the German Communist Workers’ Party has not put its signature to these amendments. (Laughter.) Indeed, just listen to what Terracini is defending and what his amendments say. They begin in this way: “On page 1, column 1, line 19, the word ‘majority’ should be deleted.” Majority! That is extremely dangerous! (Laughter.) Then further: instead of the words “’basic propositions’, insert ‘aims’”. Basic propositions and aims are two different things; even the anarchists will agree with us about aims, because they too stand for the abolition of exploitation and class distinctions. I have met and talked with few anarchists in my life, but all the same I have seen enough of them. I sometimes succeeded in reaching agreement with them about aims, but never as regards principles. Principles are not an aim, a programme, a tactic or a theory. Tactics and theory are not principles. How do we differ from the anarchists on principles? The principles of communism consist in the establishment of the dictatorship of the proletariat and in the use of state coercion in the transition period. Such are the principles of communism, but they are not its aim. And the comrades who have tabled this proposal have made a mistake. And so, they want the word “majority” deleted. If we cannot agree on such simple things, then I do not understand how we can work together and lead the proletariat to victory. Then it is not at all surprising that we cannot reach agreement on the question of principles either. Show me a party which has already won the majority of the working class. Terracini did not even think of adducing any example. Indeed, there is no such example. And so, the word “aims” is to be put instead of “principles”, and the word “majority” is to be deleted. No, thank you! We shall not do it. Even the German party—one of the best—does not have the majority of the working class behind it. That is a fact. We, who face a most severe struggle, are not afraid to utter this truth, but here you have three delegations who wish to begin with an untruth, for if the Congress deletes the word “majority” it will show that it wants an untruth. That is quite clear. Then comes the following amendment: “On page 4, column 1, line 10, the words ‘Open Letter’, etc., should be deleted.’’ I have already heard one speech today in which I found the same idea. But there it was quite natural. It was the speech of Comrade Hempel, a member of the German Communist Workers’ Party. He said: “The ‘Open Letter’ was an act of opportunism.” To my deep regret and shame, I have already heard such views privately. But when, at the Congress, after such prolonged debate, the “Open Letter” is declared opportunist—that is a shame and a disgrace! And now Comrade Terracini comes forward on behalf of the three delegations and wants to delete the words “Open Letter”. What is the good then of the fight against the German Communist Workers’ Party? The “Open Letter” is a model political step. This is stated in our theses and we must certainly stand by it. It is a model because it is the first act of a practical method of winning over the majority of the working class. In Europe, where almost all the proletarians are organised, we must win the majority of the working class and anyone who fails to understand this is lost to the communist movement; he will never learn anything if he has failed to learn that much during the three years of the great revolution. Terracini has defended the theory of an offensive struggle. In this connection the notorious amendments propose a formula two or three pages long. There is no need for us to read them. We know what they say. Terracini has stated the issue quite clearly. He has defended the theory of an offensive, pointing out “dynamic tendencies” and the “transition from passivity to activity”. We in Russia have already had adequate political experience in the struggle against the Centrists. As long as fifteen years ago, we were waging a struggle against our opportunists and Centrists, and also against the Mensheviks, and we were victorious not only over the Mensheviks, but also over the semi-anarchists. If we had not done this, we would not have been able to retain power in our hands for three and a half years, or even for three and a half weeks, and we would not have been able to convene communist congresses here. “Dynamic tendencies”, “transition from passivity to activity”—these are all phrases the Left Socialist-Revolutionaries had used against us. Now they are in prison, defending there the “aims of communism” and thinking of the “transition from passivity to activity”. (Laughter.) The line of reasoning followed in the proposed amendments is an impossible one, because they contain no Marxism, no political experience, and no reasoning. Have we in our theses elaborated a general theory of the revolutionary offensive? Has Radek or anyone of us committed such a stupidity? We have spoken of the theory of an offensive in relation to a quite definite country and at a quite definite period. From our struggle against the Mensheviks we can quote instances showing that even before the first revolution there were some who doubted whether the revolutionary party aught to conduct an offensive. If such doubts assailed any Social-Democrat—as we all called ourselves at that time—we took up the struggle against him and said that he was an opportunist, that he did not understand anything of Marxism and the dialectics of the revolutionary party. Is it really possible for a party to dispute whether a revolutionary offensive is permissible in general? To find such examples in this country one would have to go back some fifteen years. If there are Centrists or disguised Centrists who dispute the theory of the offensive, they should be immediately expelled. That question cannot give rise to disputes. But the fact that-even now, after three years of the Communist International, we are arguing about “dynamic tendencies”, about the “transition from passivity to activity”—that is a shame and a disgrace. We do not have any dispute about this with Comrade Radek, who drafted these theses jointly with us. Perhaps it was not quite correct to begin talking in Germany about the theory of the revolutionary offensive when an actual offensive had not been prepared. Nevertheless the March action was a great step forward in spite of the mistakes of its leaders. But this does not matter. Hundreds of thousands of workers fought heroically. However courageously the German Communist Workers’ Party fought against the bourgeoisie, we must repeat what Comrade Radek said in a Russian article about Hölz. If anyone, even an anarchist, fights heroically against the bourgeoisie, that is, of course, a great thing; but it is a real step forward if hundreds of thousands fight against the vile provocation of the social-traitors and against the bourgeoisie. It is very important to be critical of one’s mistakes. We began with that. If anyone, after a struggle in which hundreds of thousands have taken part, comes out against this struggle and behaves like Levi, then he should be expelled. And that is what was done. But we must draw a lesson from this. Had we really prepared for an offensive? (Radek : “We had not even prepared for defence.”) Indeed only newspaper articles talked of an offensive. This theory as applied to the March action in Germany in 1921 was incorrect—we have to admit that—but, in general, the theory of the revolutionary offensive is not at all false. We were victorious in Russia, and with such ease, because we prepared for our revolution during the imperialist war. That was the first condition. Ten million workers and peasants in Russia were armed, and our slogan was: an immediate peace at all costs. We were victorious because the vast mass of the peasants were revolutionarily disposed against the big landowners. The Socialist-Revolutionaries, the adherents of the Second and the Two-and-a-Half Internationals, were a big peasant party in November 1917. They demanded revolutionary methods but, like true heroes of the Second and the Two-and-a-Half Internationals, lacked the courage to act in a revolutionary way. In August and September 1917 we said: “Theoretically we are fighting the Socialist-Revolutionaries as we did before, but practically we are ready to accept their programme because only we are able to put it into effect.” We did just what we said. The peasantry, ill-disposed towards us in November 1917, after our victory, who sent a majority of Socialist-Revolutionaries into the Constituent Assembly, were won over by us, if not in the course of a few days—as I mistakenly expected and predicted—at any rate in the course of a few weeks. The difference was not great. Can you point out any country in Europe where you could win over the majority of the peasantry in the course of a few weeks? Italy perhaps? (Laughter.) If it is said that we were victorious in Russia in spite of not having a big party, that only proves that those who say it have not understood the Russian revolution and that they have absolutely no understanding of how to prepare for a revolution. Our first step was to create a real Communist Party so as to know whom we were talking to and whom we could fully trust. 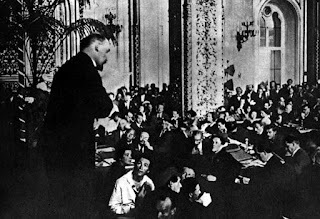 The slogan of the First and Second congresses was “Down with the Centrists!” We cannot hope to master even the ABC of communism, unless all along the line and throughout the world we make short shrift of the Centrists and semi-Centrists, whom in Russia we call Mensheviks. Our first task is to create a genuinely revolutionary party and to break with the Mensheviks. But that is only a preparatory school. We are already convening the Third Congress, and Comrade Terracini keeps saying that thc task of the preparatory school collsists in hunting out, pursuing and exposing Centrists and semi-Centrists. No, thank you! We have already done this long enough. At the Second Congress we said that the Centrists are our enemies. But, we must go forward really. The second stage, after organising into a party, consists in learning to prepare for revolution. In many countries we have not even learned how to assume the leadership. We were victorious in Russia not only because the undisputed majority of the working class was on our side (during the elections in 1917 the overwhelming majority of the workers were with us against the Mensheviks), but also because half the army, immediately after our seizure of power, and nine-tenths of the peasants, in the course of some weeks, came over to our side; we were victorious because we adopted the agrarian programme of the Socialist-Revolutionaries instead of our own, and put it into effect. Our victory lay in the fact that we carried out the Socialist-Revolutionary programme; that is why this victory was so easy. Is it possible that you in the West can have such illusions? It is ridiculous! Just compare the concrete economic conditions, Comrade Terracini and all of you who have signed the proposed amendments! In spite of the fact that the majority so rapidly came to be on our side, the difficulties confronting us after our victory were very great. Nevertheless we won through because we kept in mind not only our aims but also our principles, and did not tolerate in our Party those who kept silent about principles but talked of aims, “dynamic tendencies” and the “transition from passivity to activity”. Perhaps we shall be blamed for preferring to keep such gentlemen in prison. But dictatorship is impossible in any other way. We must prepare for dictatorship, and this consists in combating such phrases and such amendments. (Laughter.) Throughout, our theses speak of the masses. But, comrades, we need to understand what is meant by masses. The German Communist Workers’ Party, the Left-wing comrades, misuse this word. But Comrade Terracini, too, and all those who have signed these amendments, do not know how the word “masses” should be read. I have been speaking too long as it is; hence I wish to say only a few words about the concept of “masses”. It is one that changes in accordance with the changes in the nature of the struggle. At the beginning of the struggle it took only a few thousand genuinely revolutionary workers to warrant talk of the masses. If the party succeeds in drawing into the struggle not only its own members, if it also succeeds in arousing non-party people, it is well on the way to winning the masses. During our revolutions there were instances when several thousand workers represented the masses. In the history of our movement, and of our struggle against the Mensheviks, you will find many examples where several thousand workers in a town were enough to give a clearly mass character to the movement. You have a mass when several thousand non-party workers, who usually live a philistine life and drag out a miserable existence, and who have never heard anything about politics, begin to act in a revolutionary way. If the movement spreads and intensifies, it gradually develops into a real revolution. We saw this in 1905 and 1917 during three revolutions, and you too will have to go through all this. When the revolution has been sufficiently prepared, the concept “masses” becomes different: several thousand workers no longer constitute the masses. This word begins to denote something else. The concept of “masses” undergoes a change so that it implies the majority, and not simply a majority of the workers alone, but the majority of all the exploited. Any other kind of interpretation is impermissible for a revolutionary, and any other sense of the word becomes incomprehensible. It is possible that even a small party, the British or American party, for example, after it has thoroughly studied the course of political development and become acquainted with the life and customs of the non party masses, will at a favourable moment evoke a revolutionary movement (Comrade Radek has pointed to the miners’ strike as a good example). You will have a mass movement if such a party comes forward with its slogans at such a moment and succeeds in getting millions of workers to follow it. I would not altogether deny that a revolution can be started by a very small party and brought to a victorious conclusion. But one must have a knowledge of the methods by which the masses can be won over. For this thoroughgoing preparation of revolution is essential. But here you have comrades coming forward with the assertion that we should immediately give up the demand for “big” masses. They must be challenged. Without thoroughgoing preparation you will not achieve victory in any country. Quite a small party is sufficient to lead the masses. At certain times there is no necessity for big organisations. But to win, we must have the sympathy of the masses. An absolute majority is not always essential; but what is essential to win and retain power is not only the majority of the working class—I use the term “working class” in its West-European sense, i.e., in the sense of the industrial proletariat—but also the majority of the working and exploited rural population. Have you thought about this? Do we find in Terracini’s speech even a hint at this thought? He speaks only of “dynamic tendency” and the “transition from passivity to activity”. Does he devote even a single word to the food question? And yet the workers demand their victuals, although they can put up with a great deal and go hungry, as we have seen to a certain extent in Russia. We must, therefore, win over to our side not only the majority of the working class, but also the majority of the working and exploited rural population. Have you prepared for this? Almost nowhere.